The Participants tab will show all those that have registered for your Event/Membership. You will see columns for Name, payment Status, and Price. You can sort by payment Status (All, Paid, Pending, or Refunded). Click on an individual participants name in order to open up a window showing the details captured about that participant. You will see Name, Email, Gender, Phone number, answers to the optional questions you as the organizer of the Event/Membership may have asked and the participant answered during the registration process, Order number, Ticket number, and finally the payment status with date and time. 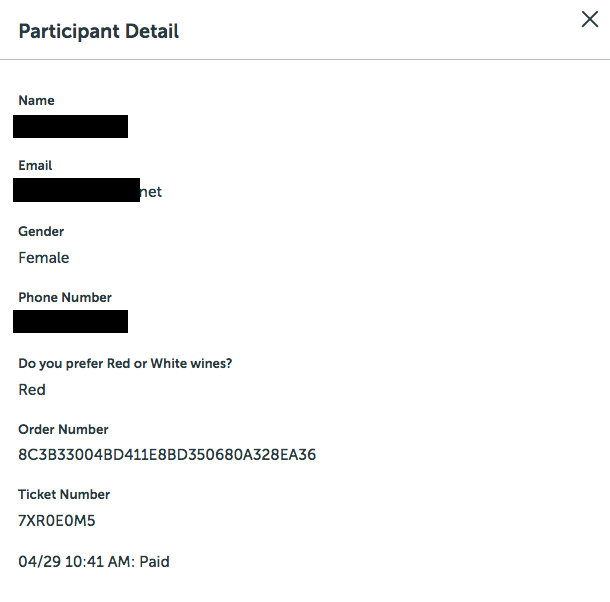 Click the blue Participant Responses link to open up a window that shows a summary of the responses to the optional questions that the Event/Membership organizer may have asked each participant to answer during the registration process. See example below for a summary of answers for a Ladies Nine & Wine event. To narrow the results showing on the Participants page, simply type a name or email address of a known participant to quickly find them.